Have you ever noticed that little phrase at the bottom of the mirror on the door of your car? It says, "objects in mirror are closer than they appear". 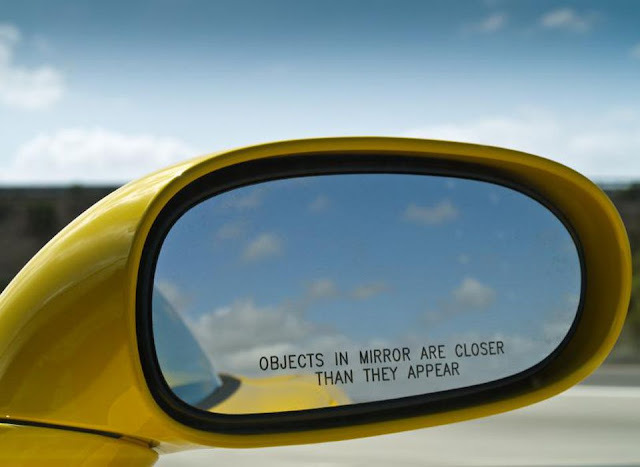 It says that because when you look at whatever is behind you in the mirror, the image is somewhat distorted and looks like it is not that close. Looking closer you see that it's right there behind you! Sometimes when I look at what I am hoping the Lord has for me, it feels like this mirror. The image is distorted a bit and it seems out of focus because its not close enough to me. What I need to see are my dreams and visions through His eyes and not a rear view mirror. He has plans for me...hope and a future. My expectations should not be distorted at all when my trust and my hope are in what He desires. I need to look to Him-fix my eyes on Jesus who writes the future and delivers it. What I am seeking is most definitely closer than it has ever been. Time to turn away from the rear view mirror and look forward to what is about to arrive! Today, when you are looking for those blessings and the favor of God to come into your life, imagine this little caption. Though you may think that you are out on the journey all alone, know that what you need may be closer than you think.